This book is in a class by itself. 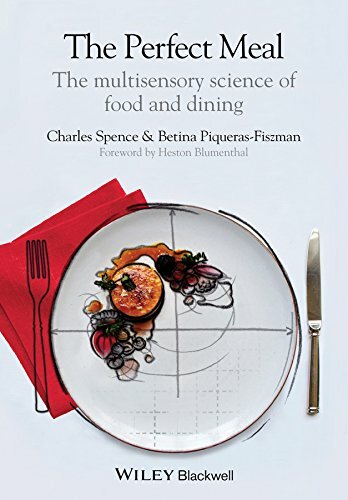 If you thought taste was located on your tongue, then this unique book will disabuse you of that notion and reveal how both eating and cooking are extraordinarily rich multisensory experiences. Charles Spence is Professor of Experimental Psychology and head of the Cross-Modal Research Laboratory at Oxford University. His coauthor is a sensory researcher in the same lab. In this far-ranging work the authors consider issues such as what the ideal number of items on a restaurant menu might be, sensitive to the danger that too many choices can distract the diner and lessen the experience. They consider food as theater, the influence of cutlery versus eating with one’s hands, and a restaurant’s atmosphere—its lighting, music, decor, and olfactory ambience. Along the way we learn of the Gourmand Syndrome, in which brain-damaged individuals develop a sudden fascination with fine food. Color turns out to strongly influence how we perceive flavor. Purple grapes don’t look quite right when served on a blue plate, and color-contrast illusions operate at many levels. It may be that the term “blue plate special” became popular during the 1930s Depression because cooks found that diners were sated with smaller portions of food when it was served on a blue plate. Shape affects gustatory judgments, too. An angular plate, for example, emphasizes the sharpness of a dish. The weight of a bowl matters, too. The more heft in your hand the more satiated you’ll feel no matter how much you eat. Labeling influences how much we snarf down. People consume twice as many candies labeled “fruit chews” than those called “candy chews.” A drink tastes better when subjects are told that it costs a lot. Extensive studies show that people can’t detect any difference between organic and conventionally grown vegetables despite the fact that 30% of consumers tested thought that organic vegetables would taste better. Expectations and beliefs shade our perception of taste even when foods are served blind in black glassware. Humans are certainly a complicated lot. This raises the interesting point of how different food tastes to the 6% of the population who are colorblind. Men with red-green color blindness can’t tell the difference between a rare steak and one that’s well done. They illustrate just how impossible it is to distinguish between flavors when visual cues are absent. This may be why despite the strange popularity of dining-in-the-dark restaurants, patrons only go once and never repeat the experience at home. Taste happens in our head, not in our mouth, and the art of the table today is as robust as it was in the 18th century or during the time of Louis XIV when chefs outdid one another with extravagant visual presentations. Food modulates brain activity more than anything else: A cup of coffee or a good meal vigorously alters our levels of neurotransmitters. What we commonly call taste is actually a much larger umbrella term called flavor, which combines gustatory, olfactory, temperature, and texture discriminations. New research shows that flavor is one of the most multisensory experiences that we have. Each of the diner’s senses — vision, taste, smell, sound, and touch—contribute to the overall experience. Even the sound of a food—the crunch and crackle in the physical resistance it gives our jaw—contributes to its savoriness. Humans did without forks for millennia. Yet when they became popular in the 19th century enormous social status was attached to them, and to spoons. So much so that to be born with “a silver spoon” in one’s mouth became a mark of good breeding.